This getaway includes 11 days/10 nights in the comfort of 4 star range properties located in 3 of Costa Rica's most requested destinations: Arenal, Monteverde, and Manuel Antonio. This getaway has it all! Ceremony is planned at a beautiful waterfall but can be moved to the beach if desired! Upon arrival to Juan Santamaria International Airport in San Jose (SJO), you will be greeted by a company representative. 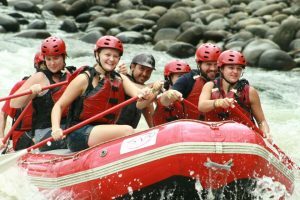 Private transportation will then be provided to the 4 Star Arenal Springs Resort located in La Fortuna. This fun little tourist town is located in the shadow of the imposing Arenal Volcano. During your stay, you will enjoy a Junior Suite equipped with king or 2 queen size beds, A/C, cable TV, ceiling fan, refrigerator, telephone, security box, hair dryer, and Terrace with an amazing view of Arenal Volcano. You will be greeted with flowers & wine in your room upon arrival. Breakfast included daily. Day 2: Wildlife Exploration or Adventure – Your Choice! Other options include Hanging Bridges, Canopy Zipline, Horseback Riding, Kayaking, ATV’s, and more. Your planner can provide you with an activity list. In the morning transportation will be provided to a beautiful waterfall where you will hike down 300 steps to be married at the base of the falls. Your guide, officiant, photographer and flowers are provided. Afterwards, enjoy a sparkling champagne toast and photos before returning to your resort for a celebratory lunch. 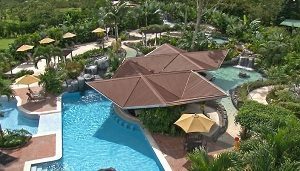 Later you will head off to enjoy the Tabacon Hot Springs where you will be able to relax & bathe in the luxurious springs. Dinner and cake is included at the hot springs. Today you will take Land-Boat-Land transportation to Monteverde. After crossing Arenal Lake which provides some of the best photo ops of the imposing volcano, transportation will be provided along the rustic mountain roads to your hotel Monteverde Cloud Forest area. During your visit to Monteverde, you will stay at El Establo Mountain Hotel. El Establo Mountain Hotel is the largest eco-resort and spa in the Monteverde region and located near the Monteverde Cloud Forest Reserve. While at El Establo Mountain Hotel, you will enjoy a Deluxe Room. Deluxe Rooms feature orthopedic mattresses, telephone, coffee maker, refrigerator, cable TV, alarm-clock, in-room safe, and balcony or terrace with rocking chairs and a view of the Gulf of Nicoya. Hotel amenities include 2 indoor heated swimming pools, restaurant, bar, gym, conference center, spa, tennis courts, basketball court, soccer field, and internet.Breakfast is included daily during your stay. A bilingual naturalist guided will lead you through the canopy of the Cloud Forest via Suspended Bridges for a bird’s eye view of the animals that inhabits the jungle. Monteverde is a unique ecosystem, home to many types of plant and animal species. Orchids abound, and if you are lucky you may see the famous Quetzal! Take today to explore and enjoy the Monteverde area on your own. You can visit the Monteverde Cloud Forest Reserve to hike on your own or hire a guide, or schedule an adventure like an ATV Adventure or Horseback Ride. However you decide to spend the day be sure to take advantage of this day in the clouds! Shuttle transportation will be provided to the Hotel Costa Verde, located in Manuel Antonio. This hotel offers amazing views of the Manuel Antonio coastline and Pacific Ocean. During your stay, you will enjoy a Studio Plus Room. The 750 sq ft Studio Plus Room offer panoramic ocean views, 2 beds, kitchenette, flat screen tv, and ceiling fans. This property offers 3 pools along with interesting touches such as the El Avion restaurant, built around a real airplane, and offering amazing sunset views. This tropical paradise is recognized world-wide for its beautiful beaches and the abundant wildlife of the jungles that line them. Breakfast can be added at the hotel, you can utilize your kitchenette by shopping at the local market, or enjoy any of the area restaurants. Take today to explore and enjoy the beautiful beaches of Manuel Antonio. This area is famous for its palm studded beaches and wildlife. The monkeys are sure to put a smile on your face! Top recommendations include Biezans Beach and Manuel Antonio Beach (within the park), taking a beginnger surf lesson, or just sit back, relax beneath a shady palm and work on that tropical tan. Today you will enjoy a Catamaran Cruise Coastal Adventure through coastal waters. This is a great way to possibly observe whales, dolphins & sea turtles. After cruising along the beautiful shores of Manuel Antonio, you will stop at a secluded beach to Snorkel above a Tropical, Coral Reef and enjoy a provided Meal. Timing of this tour is dependent on tides, can be in morning or afternoon. One last day to relax and enjoy the Manuel Antonio area. Whether you lounge on the beach, or add an adventure, be sure to make the most of this full day in paradise! Day 11: Fly Home – ¡Pura Vida! Private transportation will be provided to Juan Santamaria International Airport scheduled to arrive 3 hours prior to your departure. Add $500 for travel during Peak Holiday Weeks: Dec 23 – Dec 31 (Christmas/New Years) or March 25 – April 1 (Easter Holy Week). Want to get married at the Beach instead? We can rearrange the itinerary!